There’s so much to see in this world. From the Grand Canyon to the Ancient Pyramids of Giza, there is at least one mind-blowing attraction to discover anywhere you go. And the countries that have these great tourist attractions? They are happy to see you bring your tourist dollars into their borders. The question is: just how many dollars are spent, and where? 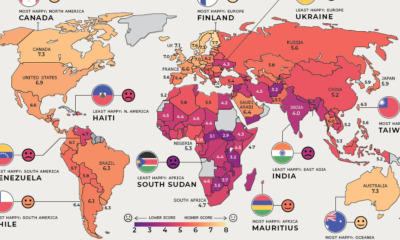 Today’s map comes to us from HowMuch.net, a cost information site, and it shows the countries that rake in the most tourist dollars each year. The United States brings in $220.1 billion each year from tourists. The country is large and diverse – it offers the bustle of big cities like New York and San Francisco, but it’s also home to cities known for their history or culture, like New Orleans or Washington, DC. Tourists can experience the beaches of SoCal, the madness of Vegas, the serenity of Oregon, the wilderness of Alaska, or the music of Nashville. France is a distant second place at $66.8 billion per year. The biggest destinations include Paris, the famous wine regions of Champagne or Bordeaux, the Renaissance city of Lyon, the quayside of Marseilles, or the French Riviera capital of Nice. Spain isn’t far behind France, receiving $65.1 billion of tourism expenditures each year. The biggest country on the Iberian Peninsula has more to offer than trips to Ibiza and tapas in Seville. The architecture of Barcelona is magnificent, Madrid is bustling, and there are many hidden cultural gems to be found, such as Moorish monuments and castles throughout the south. The United Kingdom has a diverse array of treasures, and that’s why it rakes in $62.8 billion from tourism per year. Tourists can explore the scotch and Highlands of Scotland, or succumb to London calling. The countryside of Wales, the Roman-built pools of Bath, or the fried night foods of Edinburgh all have appeal. This was the home of the Beatles and Shakespeare, after all. China tops out Germany by $1 billion to be the fifth-most visited country in terms of tourist dollars spent, with expenditures of $56.9 billion. This is perhaps the biggest surprise on the list – people know China is emerging as the world’s biggest population center and economy, but many do not know it is also a tourist mecca. China gets millions of visitors each year from surrounding Asian countries like South Korea, Japan, Vietnam, Malaysia, and Mongolia. The country also receives significant traffic from Americans and Russians. The Great Wall of China, the Forbidden City, the Three Gorges Dam, and many other sites are high on the list of things to see.